I just got an email from Francis Morgan of the ReadingTeacher.com website, suggesting I add his program to my resource list. Absolutely! I can't believe I haven't noticed it before. 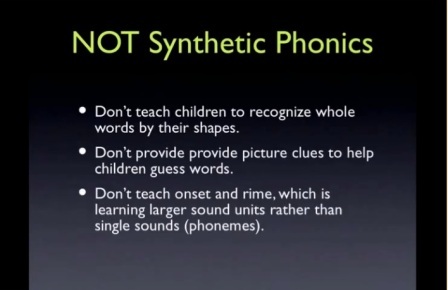 It looks like a really nice, explicit, systematic, synthetic phonics program for little kids. It's from the US so the sounds will be slightly different from the Australian English I speak, and from UK and other Englishes without a syllable-final "r" sound. But small Australian children know what the American accent is from watching TV, so for little learners without speech-language difficulties this shouldn't be a major barrier. Some of this program is free and the rest looks good value for money. To find out more about it, click here. I work mostly with older, struggling learners, many of whom also have spoken language difficulties. Thanks to all the research I've done for this blog, I have a long resources-to-buy wishlist for my clinic. So a ReadingTeacher.com subscription is lower down my own list than resources specifically targeting older, reluctant readers. This entry was posted in sound-letter links, sounds, spellings, teaching strategies, theory on April 26, 2013 by alison.